I'll have to suggest to Michael to post some updated video footage, but I've actually made so much progress with Kili now that I don't think she's seriously bit me in months. Michael tells me that I hesitate too much when I put my hand near her to pick her up but it's only because she sometimes walks away from me and I'm afraid that if I chase her with my hand, she will feel threatened and try to bite me so I can't pick her up, that she will get scared enough to fly away and learn to just keep flying away from me, or that if I pick her up and hold her in my hand, she will bite me while I'm holding her because I forced her when she was trying to get away. When this happens, I usually just pull my hand back instead of chasing her with it, and then I turn away from her and she lost her opportunity to get an easy treat. Then I'll try again (sometimes 2-3 times) until I can finally pick her up and hold her in my hand. There's been so much progress made that when she's taken to someone else's house, she will still let me grab her there, and I've grabbed her before without having treats in my hand, and with an increased variable ratio of reinforcement (combination of step ups, grabs). Michael wrote: 3. The Defensive Bite - This can result from touching the parrot where it does not want to be touched, taking away something, or getting into its territory. This kind of bite is purely out of self defense and is best avoided by not infringing upon the parrot's territory so abruptly. The best way to overcome defensive biting is by systematic desensitization through positive reinforcement. Rather than just trying to grab the parrot's wings, start with having hands close to bird, then a small touch to wing, then cupping wing in hand, then opening slightly, then opening more, etc while progressively rewarding each step. This can take anywhere from 5 minutes to forever depending on how defensive the parrot is and how unpleasant what you are doing is. I ran into this situation last night. I have such a good relationship with Jessie and most of the time, I can do anything with him. Last night, I went to go get him out of his cage for some cuddle time. Usually I walk up to his cage, put my hand on the latch to upon the door and ask him if he wants to come out. If he's in the mood, he'll come to the perch in front of his door and start bouncing back and forth from foot to foot. This is my cue that he's in the mood to come out. If he stays where he is then I leave him alone and try again later (which doesn't happen very often). Last night I had a 'duh' moment and just went over, opened the cage door and put my hand up to where he was perched in the top of his cage. Needless to say I got nailed pretty good last night. I do have to say that not reacting to a bite is one of the hardest things to do. I got reminded once again last night, that you always need to take the time to read their body language and give them the choice whether they want to do something or not. Is it a bad idea to let my parrot preen me? My senegal sits on my shoulder for long periods of time and gently nibbles my cheek, but she's been getting a little rougher- not enough that it leaves marks or ACTUALLY hurts, but enough fo me to lift my hand and ease her away from me. You know, there is not a cut and dried answer to that. I think you will need to watch your hen and see if she is likely to bite you. Personally, I do not allow my males on my shoulder or any where near my face. Both of my males are rehomes and I can't always predict their behavior. Jack can be especially reflexive when it comes to biting. If you consider that paired, it would be the boys job to protect the nest, you can understand this isn't an "unreasonable" behavior. If something startles them or makes them insecure, they are very likely to bite and they will bite hard. For most people, it is difficult to recover from a face bite so I just avoid this by not allowing them on my shoulder at all. My hen is eight years old and she has been mine all of her life. She is very much a free spirit and a very good flyer. She can be very gentle and affectionate so I do allow her on my shoulder. Having said that, she isn't 100% reliable either and she does have little temper tantrums where she will peck me pretty hard......but she's so affectionate and delightful and seems to be able to temper that "bite reflex" so....I am aware of the risk but allow it. So...you will have to be the judge but my advise is....if you do get bit you have to realize that you made the choice and the call and be understanding about it. If you see that your bird has a quick bite tendency and bites HARD....I'd say, nix the shoulder entirely. 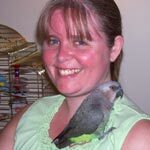 There are a lot of other fun ways to interact with your bird and it isn't worth getting a bite on face. I would also reinforce the bird as much as possible for NOT being on your shoulder. Reinforce the bird for sitting on your hand or on a perch. As the bird matures, you will be very thankful that you did. I don't let Kili on my shoulder for the most part unless I put her there. From time to time she'll land there and then start getting bossy and nip my ear for attention. So instead I use shoulder time strictly as a reward and only for the duration of good behavior. Often I use the chance to go on my shoulder as a non-food reward for flight recall. If she lands on my shoulder without being called I shake my shoulder and shout "OFF." I am new the forum which I just found today when searching for "Senegal biting" tips although I have enjoyed Michael's Kili videos on U-tube for the past year. I met my (DNA tested) female Senegal, Verdi, almost a year ago when I visited the wonderful parrot rescue organization in Iowa where she had been taken by her prior owner. She was not an abused bird - she was very well socialized both by her former owner who just could no longer care for her and by the rescue folks who, amazingly, managed to give individual daily attention to all of the 40 - 50 birds under their care at any one time in a fabulous, partially free flight rescue facility. They warned me that Verdi did not tolerate other birds - that she was definitely imprinted on people - so my aviary of 4 budgies in aeparate room from her large cage is perfect to let her hear other birds but not be threatened by or compete with them for attention. She is a sweet and very smart bird who has chosen me as her person but does tolerate other people and new situations well. She communicates much of what she wants through speech but she does have biting issues at times. I've tried to observe cues that let me know when she will bite. It is interesting to see your classification of bites because I've basically divided her bites into three types: 1) mild, 2)hard, and 3) "blood draw". The mild bites fall into two catagories a)Playful and b)Warning. The playful bites are essentially what she would do to another bird - little nibbles that do not hurt at all. The Warning bites are just that - she is letting me know that if I don't stop doing whatever it is that elicited the warning bite, she is going to bite harder (usually a blood draw bite) next. Most of the "warning" bites seem to occur when I want her to go somewhere she does not (i.e. back into her cage because I need to leave for work or she needs to go to bed sooner than she wants to - when she is ready to go to bed she goes right in). I have found that in response to a warning bite, if I close my fist (i.e. do not provide her the opportunity to get her beak around my finger) that diffuses her agression. She tries to grab the skin on the back of my hand but can't get a good purchase on it so after a couple of attempts she stops and essentially gives me a "you win" look and then she will follow commands and go where I want. Sometimes this doesn't work so I take her to the top of the cage or her Java Tree for a "time out". After 5 minutes or so she calms down and I can offer the back of my hand for her to "step up" which she does and I can then put her in the cage. When I am putting her on her perch in the cage, I alwasy make sure my hand is in a fist so she can't grab an exposed finger as I withdraw my hand (I learned that the hard way). 2) Hard bites usually are predictable. These occur when Verdi is in a bad "2 year old tantrum mood" and she takes on a stance that my husband calls "statue bird". She crouches down and sleeks her feathers and her eyes take on a "glassy" appearance. The best things to do when she is like this is let her have a "time out" until she takes on a normal stance on her own or try to distract her with something she likes: food or a toy. It is amazing to watch her melt from "statue bird" to "cuddly bird" - like flipping a switch. Finally there are the "blood draw" bites. These are usually in response to a startle (sometimes it's hard to figure out what startled her) or not heeding the "warning bite". So most of these can be avoided - the only ones ththat are unavoidable are the "unpredectible startle" bites. Fewer than 10 hours of sleep or noisy thunderstorms at night seem to make her more irritable and thus more likely to startle. I'd be interested to hear your thoughts on these behaviors. Mona wrote: This could be a good forum topic. What do people do to reinforce (and set up) appropriate communication between their birds and themselves? Trick training is an easy answer but I think there are lots of other ways to do this. For example: When Phinney is uncertain about an object and moves away from it (she sees it as being aversive), I tell her "It's okay. It's okay. It's okay"
I will then move and touch or chew the object so she can see that "it is okay"....and then I will often give her a moment to also move to the object. If she does move towards the object, she is reinforced and if she touches the object, she is reinforced. The object is to teach her "It's okay" means that "all is safe". In time, the bird responds positively to that simple cue. Greys will often even say it if they are nervous. Phinney says it quite often. Another bird startles and Phinney will say, "It's okay. It's okay"
It is vitally important to maintain the integrity of this cue and NEVER use it in a situation that the bird might perceive is a real threat. That's just one example of reinforcing nonverbal communication between the person and the bird. The bird is communicating to the person by moving away from an object. (nonverbal) They are saying, "This is something I want to avoid". You acknowledge their communication by letting them move away but then you approach the object yourself and say, "It's okay." A well socialized bird will often want to participate in whatever you are doing that looks like fun and they will also move to the object. You reinforce any voluntary movement towards the perceived "threat" and in time, you develop a very trusting back and forth between yourself and the bird. In time, the bird absolutely learns that "It's okay" means that every thing is safe. My husband and I do something similar with our senegal. We stopped saying 'no' to him all together and now say 'be careful.' I think this helps both him and us as we tend to say 'be careful' in a more calm and collective manner. Also, these birds are prone to 'light terrors,' meaning that they get scared and can react unexpectedly with sudden changes in light. So whenever I have Toby with me and I need to turn a light on or off, I look at him and say, 'Toby, be careful' a few times and then turn on the light. If I give him warning before I do sudden things like that, he is less prone to bite me unexpectedly or fly away scared. It's been a year since my last post here and I've learned quite a lot about Verdi and preventing biting. I thought I would pass along a few tips that work for Verdi and me. First, Verdi has slept outside her cage on her Java tree for the past 6 months. She basically communicated to me one evening that she wanted to sleep outside her cage. I had bee away most of the day and she had bee out for only about 45 minutes when it was time for bed. As I walked toward her cage with her, she took off and flew to her java tree in the great room. When I tried to get her to step up she lunged at me. It was a weekend night so I decided to try an experiment. I let her sleep on the java tree and I slept on the nearby couch with a lamp I could turn on quickly if she startled and took off. She did fine and has slept that way ever since. I bought several motion activated lights at the hardware store and placed them around the room where she sleeps so the lights will come on if she ever takes off in the dark- so she won't fly into a wall in the dark. Allowing her to sleep outside the cage basically gives her at least 12 hours outside of the cage per day so she is much more content when she does have to be in the cage and much less aggressive. Of course when I am gone for a few days she has to stay in her cage - the petsitter who comes twice daily just is not experienced enough with birds to let her out. For that reason I'm purchasing a flight cage soon. The second tip to prevent biting is pretty simple - she gets a treat for going In the cage when I leave for work in the mornings. Finally the last tip is going to sound crazy but I learned to speak her language. After observing how the parakeets spar and squabble, one day when Verdi bit my finger I responded by making an "aak,aak,aak" noise over and over until she let go. It has worked ever since - now as soon as she starts to nip I make the noise and she stops. No more bloody fingers! Ive had a look through this very informative thread but cant find an answer to my problem..... yet! My Jenna is about two and a half. She was given to me by a friend who's relationship had broken down and neither of them wanted the Sennie. I've had her for about 9 months now and although we got on fine at first, things have detriorated. In the last month Jenna has gone from a "typical" Sennie to a spiteful ball of beak and feathers. If i go close to the cage I get hissed or screamed at. When I change her food and water I have to do it quickly and risk getting bitten. She will lunge aggresively at me through the cage, bite the bars and will then move as far away as she can. I have recently moved, 3 months ago, and at first things were fine and she explored our new home and I am now able to spoend more time with her. She's a lovely little thing but her temprament has changed drastically. She used to love coming out of the cage but although she still comes out, its only for a few min at a time. Also when she is out I have to be careful as its not unusual for her to fly at my face (i'm no adonis but i didnt think i was that ugly lol). Tried giving her her favourite treats when she is close to the bars but even these have no effect. I have loads of paitence and will keep trying different ideas but struggling a little at the moment.